You are here: Home › MagicBands › Many MagicBands are 15% off through June 19th online directly from Disney! ← Three Frozen Ever After ride MagicBands coming to Epcot? Many MagicBands are 15% off through June 19th online directly from Disney! Disney is have a major MagicBand sale for the next few days through June 19th, 2016. Online on the Disney Store and in the Shop Disney Parks app, many Open Edition and Limited Release bands are on sale at 15% off regular prices. If you have been waiting for specific designs at a cheaper price, now is your chance! 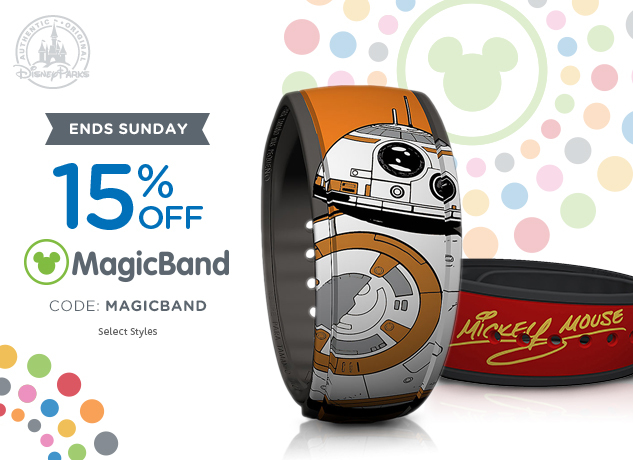 Click here to go directly to the Disney Store for the 15% off sale and use coupon code MAGICBAND at checkout. Some of the highlights include the Limited Release Zootopia and purple Haunted Mansion bands, as well as the some of the new Star Wars and Figment Open Edition MagicBands. 3 Responses to "Many MagicBands are 15% off through June 19th online directly from Disney!" Great find! Use promo code FREESHIP for today only with that Dory band to get free shipping as well. How were you able to do that. It won’t let me get discount ? Tough with all these LE. I’m about to start financing the purchase of them lol.